Rossini, Armida. Metropolitan Opera, 4/12/2010. New production premiere directed by Mary Zimmerman, conducted by Riccardo Frizza with Renée Fleming (Armida), Lawrence Brownlee (Rinaldo), John Osborn (Goffredo), assorted other tenors. I should have known it was going to be trouble from the picture of Renée Fleming wearing a hot pink dress and waving a wand on the Met website. Enchanting! Astonishing! Magic! was promised. But Armida is a Saracen sorceress who seduces and abducts upstanding and heroic Christian crusaders. She’s Carmen in the Holy Land with magic, or Thaïs without the reform (the latter Renée should understand). Renée Fleming in this production is a grown-up Disney princess whom her chief conquest Rinaldo would never fear to bring home to his mother. In a nutshell, the production is fatally unsexy. The trope of knights seduced by heathen women is more fully explored and clearly stated in Monty Python than it is here. The knights are a random assemblage of dudes in uniform, their internal power struggles given no gravity or significance at all, Armida’s lair is populated by generically exotic women who seem nice enough. 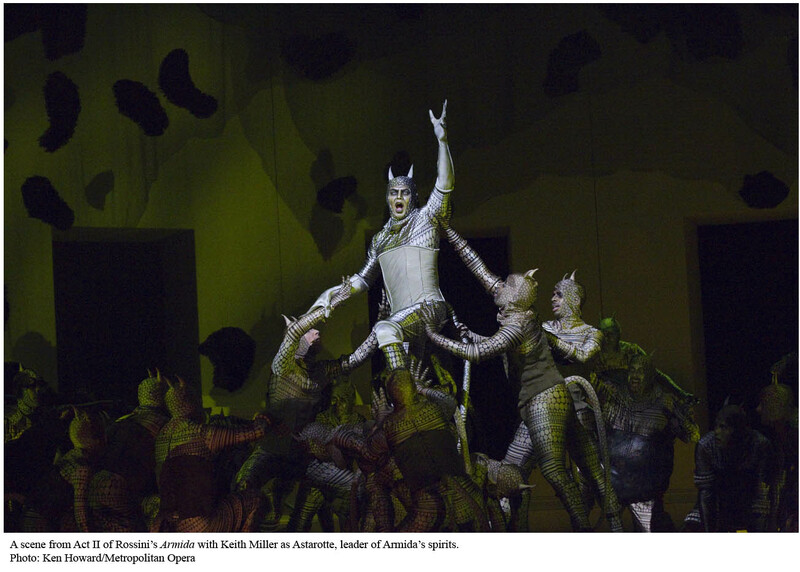 Armida’s demons, to whom Rossini gives some quite creepy music, are just embarrassingly silly with their tails and devil ears and slinky choreography. My companion pegged their look as straight out of Cats. Armida is not supposed to be scary and evil because she has poor taste in mega-musicals. Armida’s magic isn’t just literal magic, it’s a stand-in for a threatening Other of female sexuality threatening good Christian soldiers. But this production completely ignores this in favor of sparkles. The production has its pretty moments but is completely without bite. Rossini’s final scene, as Rinaldo escapes Armida’s grasp, has some intense music, but it just feels tacked-on here due to the low emotional stakes. The superfluous allegorical figures of Love and Vengeance wandering around don’t help give things any gravity, either. You can’t accuse Zimmerman of not listening to the music. Every change of tempo and meter is marked with a clear stage action or lighting cue. The effect is redundant and lifeless, because even though the music moves in blocks the dramatic flow should transcend the sectional construction. Just because the story is told in numbers doesn’t mean the numbers themselves are the story. The stage action references the music too directly and too frequently to assume any kind of life of its own. Every single time we have an inner monologue or ensemble in which the participants are not supposed to hear each other, the lights dim to spots telling us what is up, you know, they can’t hear each other! It insults the intelligence of the audience as well as being boring. The arias suffer the from some horribly static stagings (with decisive walking in the orchestral transitions). I know this is complicated music to sing and we are dealing with lots of tenors here, but it’s dramatically just flat. Zimmerman manages to find much more emotion and narrative in the duets, but the directing of the chorus is mostly aimless milling about on the production’s dull unit set. The ballet in Act 2 was somewhat entertaining, Graciela Daniele’s choreography a questionable mix of semi-ballet and cutesy hip-shaking. The point, a central male dancer corrupted by many lady dancers, was clear enough, but the dance’s dramatic status was unclear, it was not positioned as a fantasy sequence but rather as a diegetic entertainment for Armida and Rinaldo, but it was unclear who was staging this for them or what it was supposed to mean. Now for our many tenors. Lawrence Brownlee was fantastic in Rinaldo’s more lyrical music, and he tossed off the coloratura with impressive ease and precision. I like his sweet and round tone, which projects just fine, but didn’t find it quite right for this role, where I think a certain degree more heft and heroism is required. Too soon for him? Perhaps John Osborn, who sang Goffredo, would be better suited to Rinaldo, though his tone is less beautiful it has a ringing strength that seems appropriate. He was excellent in the smaller role of Goffredo, though. Joining Brownlee in the infamous tenor trio were Barry Banks and Kobie van Rensburg as two more knights, both sang well but the piece didn’t quite add up somehow. Riccardo Frizza conducted a very clean and precise reading from the orchestra that was maybe a bit short on dramatic weight and mystery–or maybe that’s just the production. The instrumental solos, particularly the cello and violin, were excellent. I know that my impressions of this production are heavily colored by a different Armida that I saw last summer, or rather an Armide. (The plot, an episode from Torquato Tasso’s Gerusalemme Liberata, has been set not only by Rossini but also Lully, Handel, Haydn, Gluck, Salieri, Dvorak, and others.) This was Gluck’s opera of 1787, it was at the Komische Oper Berlin in a production by Calixto Bieito (NSFW clip and interviews here repeat not really that safe for work). 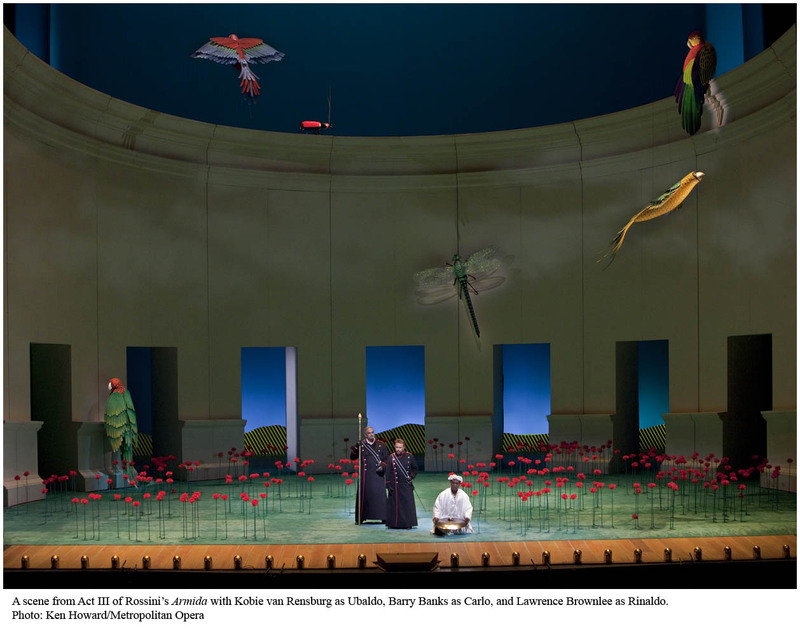 I honestly find Gluck’s opera much more interesting than Rossini’s, and Bieito’s production, which positioned a determined, modern Armida in a business suit against an army of naked male prisoners, um, made an impression. It had all the danger and violence that this one lacked, perhaps all too much danger and violence, but Armida’s powers were clearly drawn. We’re getting a revival of this Rossini next season, good lord. Can I petition to either bring Bieito’s Gluck Armide over from Berlin (come on, it would get the Met in the news for sure! 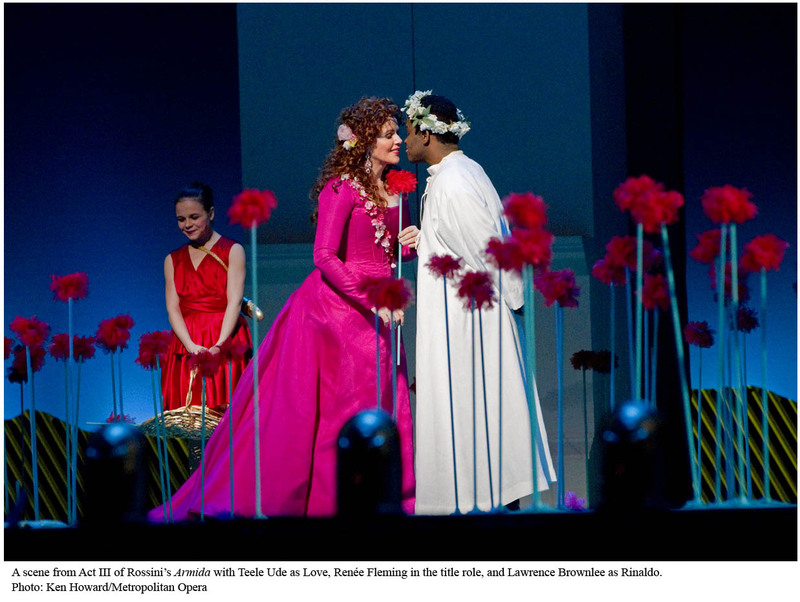 I CANNOT picture Renée Fleming going anywhere near a Bieito production but vocally the Gluck would probably suit her voice much better than the Rossini) or maybe get William Christie to bring Les Arts Florissants to do the Lully Armide instead? I acknowledge the complete infeasibility and impossibility of this but I just want to say that you can do much better with Armida than this current specimen. Just found this blog – I love it! So well written and well informed. And nice to see another huge Strauss fan! Agree that this was not a good production, and that for the most part Fleming shouldn't be doing these coloratura roles anymore. There is however a live recording from Pesaro 1993 of Fleming singing this (quite early in her career) and she's incadescent there – probably my favourite non-Callas Bel Canto recording ever made. When I saw this I couldn't make my mind up whether the designer and director were consciously riffing on Monty Python and the Holy Grail or blissfully ignorant. In the first act I really expected the chorus to burst into "We're knights of the round table" and the "You are in great peril" "No I'm not" scene was straight out of Python.